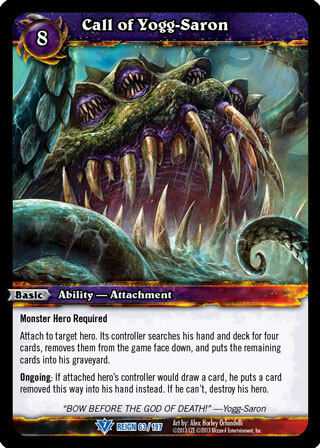 Attach to target hero. Its controller searches his hand and deck for four cards, removes them from the game face down, and puts the remaining cards into his graveyard. Ongoing: If attached hero's controller would draw a card, he puts a card removed this way into his hand instead. If he can't, destroy his hero.